You must be prudent when you're choosing garage doors. It's not recommended by Garage Door Repair Huntington Park to get the cheapest door but it's not necessary to get the most expensive option either. What's important is getting a door, which will protect and insulate your house properly. Invest in openers, good materials and components. When you get branded garage door parts, you can be sure of their quality. There's no point investing in cheap, no-name ones because they won't last long and you will need to replace them sooner. So, you will ultimately pay double. Branded products are also of similar sizes, so you won't have trouble finding the proper ones. Get a garage door opener based on the size, weight, use and type of the garage system. Choose the right horsepower (1/2 hp for most residential doors). Check whether there is space on the ceiling and think whether you need a silent (belt drive motor) opener. Garage Door Repair Huntington Park recommends choosing as many safety features possible. Our specialists have found out that there are homeowners who do not include the garage doors in their regular house cleaning and maintenance causing them to be neglected. 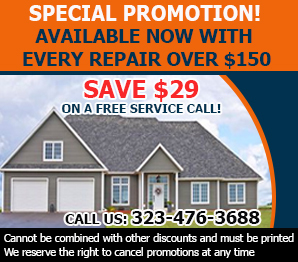 Failing to take care of the garage door can cause problems in the long run, such as malfunctions or total breakdowns. Avoid these by not forgetting to clean and maintain your garage door. Since the garage door spring holds a lot of tension, it is in your best interest to only allow one of our experts to replace any broken springs. It takes great care and precision to know how to carefully remove the spring and install the new one.